Air travel in Thailand is cheap and easy as Bangkok is well served by budget airlines. Domestic flights in Thailand are good value. If you’re leaving Bangkok by air to other destinations in the region or domestically there are several airlines to choose from. Air Asia, Nok & Thai Lion Air flights depart from Don Mueang Airport which is Bangkok’s Low-Cost Carrier hub. Thai Airways, Thai Smile, Vietjet & Bangkok Airways fly from Suvarnabhumi International Airport. Domestic flights in Thailand fly directly to over 25 destinations from Bangkok. Another 15 destinations are available as fly and ride packages with onward travel from the nearest airport by bus and/or ferry. There are also direct connections between regional Thai cities such as Chiang Mai, Pattaya, Phuket and Hat Yai. Internationally there are direct flights from Bangkok to nearly all Asian destinations. Some International flights also leave from Chiang Mai, Chiang Rai, Phuket, Pattaya, Hat Yai, Hua Hin, and Krabi. No destination airport in Thailand is more than a 75-minute flight from Bangkok. Fares are good value mostly costing from 1000-1500 baht one-way outside of national holiday periods. and as low as 400 baht during promotions. 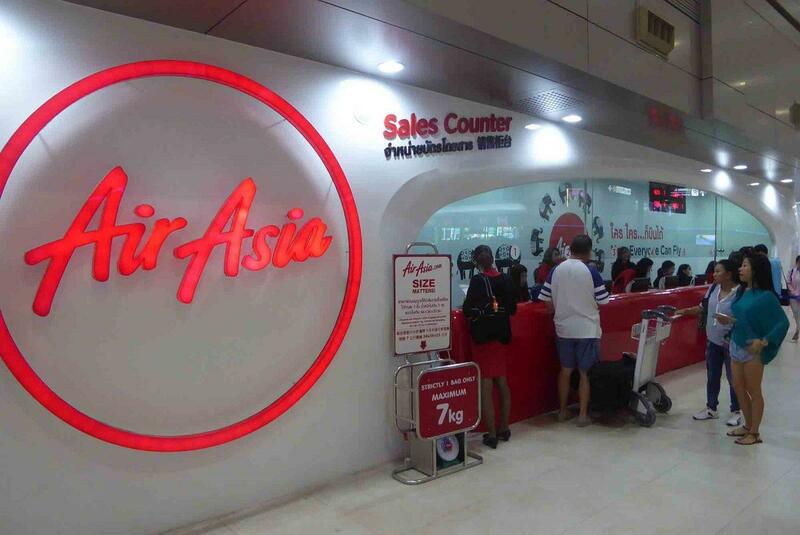 Air Asia has a large network and usually offer the lowest fares though they sting you with extra charges for checked luggage. Most other low-cost operators include this in the ticket price. Book your luggage in advance online as the charges are excessive at the airport. They fly Internationally from Bangkok to almost all nearby Asian countries. There are also flights to Japan, Korea, Australia, New Zealand, Iran, Oman, Saudi Arabia, India, Sri Lanka, China, and Nepal. Some routes are direct and some go via their hub in Kuala Lumpur . They operate an extensive network of domestic flights in Thailand. Air Asia flights depart exclusively from Don Mueang Airport. Nok Air is Air Asia’s main competitor domestically with a similarly extensive network. Their fares are usually slightly more expensive but include 20kg checked luggage on domestic flights and 30kg on International flights. You also get an in-flight snack & a bottle of water. Internationally they fly to China, Japan, Laos, Singapore , Taiwan, Myanmar, and Vietnam. Some International flights are code-share with their partner Nok Scoot. 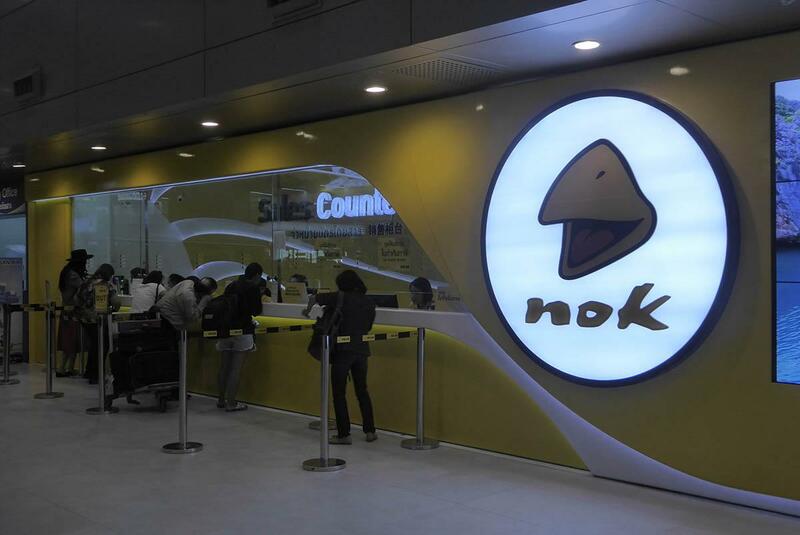 Nok Air flies exclusively from Don Mueang Airport. Air Asia and Nok Air let you reserve flights online and then pay for them later. You have to pay within 24 hours of making the booking. If you book a flight within 24 hours of departure or if the flight is almost full you may have only a few hours to visit a convenience store to pay. This can be done at branches of 7-11, Family Mart, Tesco Lotus convenience stores, or Post Office Counters. You can also book flights over the counter at most 7-11 branches. Both airlines have ticket counters at Don Mueang Airport at departure level in both terminals. Thai Lion Air operates domestic flights in Thailand to 9 destinations and Internationally to Indonesia, Malaysia, Myanmar, and Singapore. Checked baggage is free depending on the route & class of travel. Domestic flights offer 10kg free checked luggage and 20kg on International flights & up to 30kg on the Yangon route. Hand luggage is 7kg. 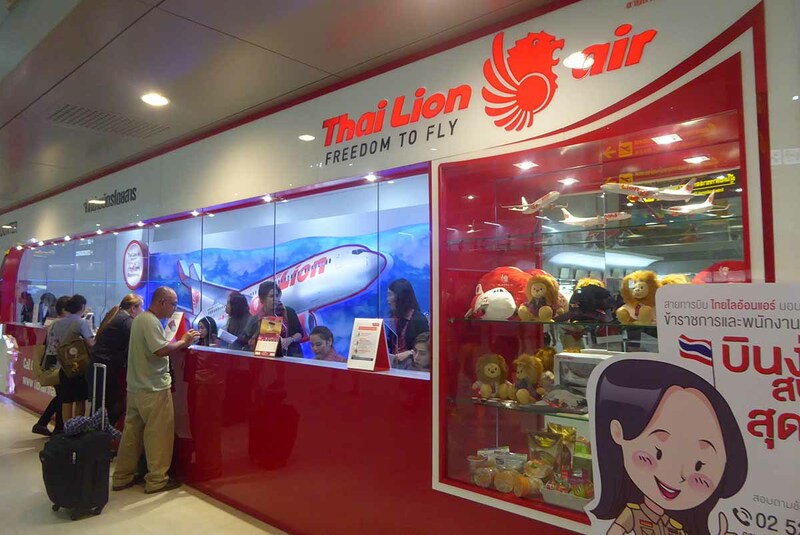 Thai Lion Air operates exclusively from Don Mueang Airport. Tickets are available online or at the ticket offices on the departure levels of terminals 1 and 2. You can make an online reservation and pay for your ticket in cash at branches of 7-11 and Family Mart, Tesco Lotus or at Post Office counters. Thai Smile is a low-cost subsidiary of Thai International Airways. They run both domestic and International routes exclusively from Suvarnabhumi Airport. The only exception is flights to Mae Hong Son which depart from Don Mueang. Fares are usually more expensive than the other low-cost airlines but cheaper than flying with Thai. Checked baggage, meals, and seat selection are included. Tickets are available online or at the ticket office on the departure levels of both Suvarnabhumi and Don Mueang airports. Thai Airways is Thailand’s national carrier and operates flights from Bangkok to many destinations worldwide. 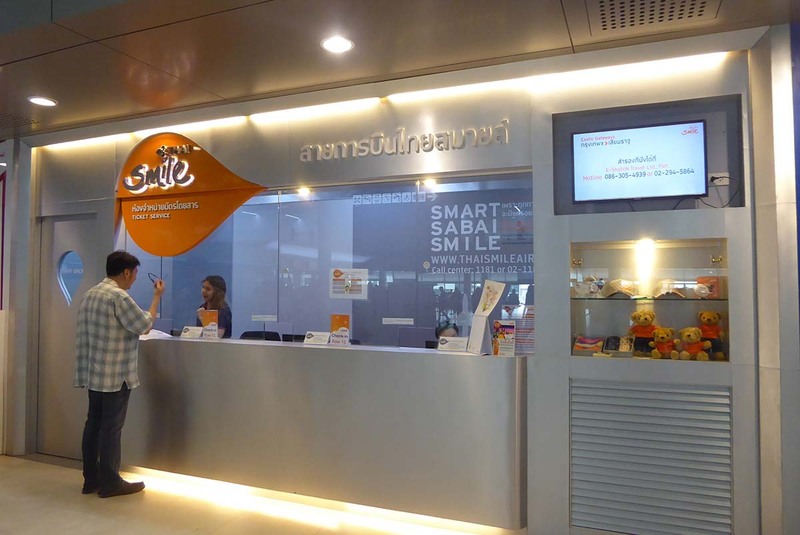 Domestically their network is limited with other destinations operated by their lower-cost subsidiary Thai Smile. Fares are more expensive than the low-cost carriers but include the usual major airline level of service. Domestic flights in Thailand only leave from Suvarnabhumi Airport. Thai is the only airline apart from Bangkok Airways that offer flights directly to Samui. 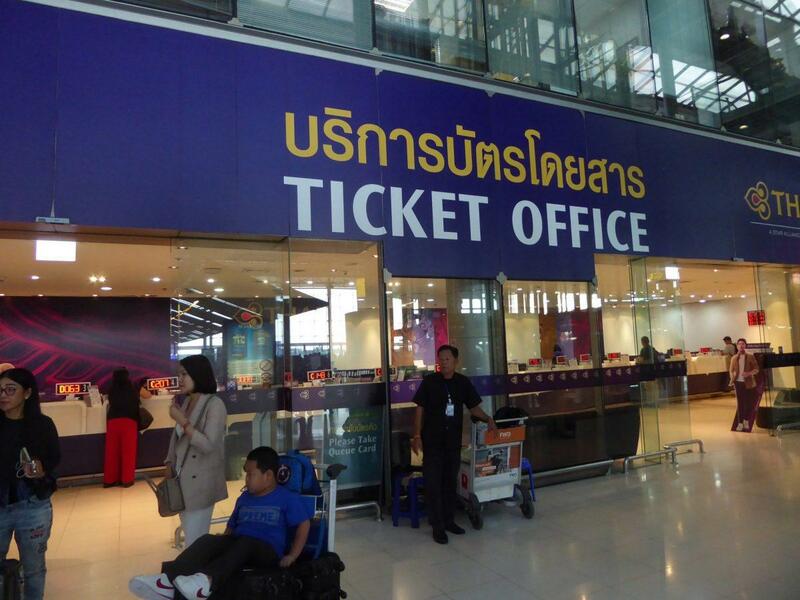 Tickets are available online or at the ticket office on the departures level at Suvarnabhumi airport. Online bookings must be paid for in cash at branches of Family Mart, Tesco Lotus, Big C and Post Office counters. 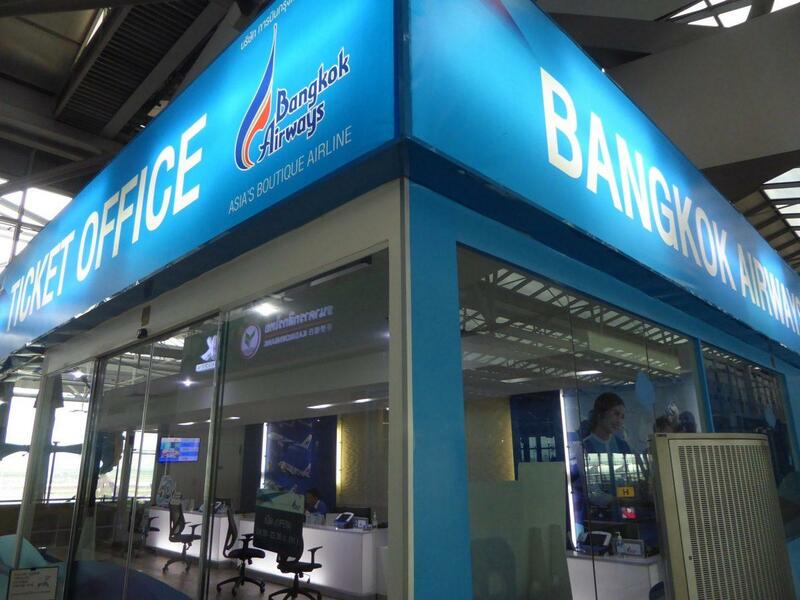 Bangkok Airways labels itself as a boutique airline and provides a high level of personal service. The airline offers International flights to Bangladesh, Cambodia, Hong Kong , India, Laos, Maldives, Malaysia, Myanmar, Singapore, and Vietnam. Bangkok Airways are the only airline flying directly to Sukhothai, and Trat. They also fly to Samui along with Thai Airlines. Fares are higher than the low-cost airlines but lower than major carriers. There are no extra charges for checked luggage, meals, and seat selection. All flights depart from Suvarnabhumi Airport. You can buy tickets online or at the ticket office at Suvarnabhumi on the 6th floor. Online bookings must be paid for in cash at branches of 7-11, Family Mart, Post Office counters, Tesco Lotus and Big C.
Vietjet is a Vietnamese budget airline which operates in Thailand as Thai Vietjet. The airline offers International flights from Bangkok. Destinations are the Vietnamese cities of Ho Chi Minh City, Hanoi, Danang, (for Hoi An) and Dalat. They also fly to Taichung in Taiwan. Domestic flights in Thailand serve Chiang Mai, Chiang Rai, Krabi, and Phuket. There is an extra charge for checked baggage. All flights depart from Suvarnabhumi Airport. Tickets are available online or at the customer service counter at the check-in desks at the airport. Thai Vietjet is often cheaper than the other low-cost carriers. Scoot and Tiger Air both have low-cost International services to and from Bangkok. They depart from both Don Mueang and Suvarnabhumi Airport. 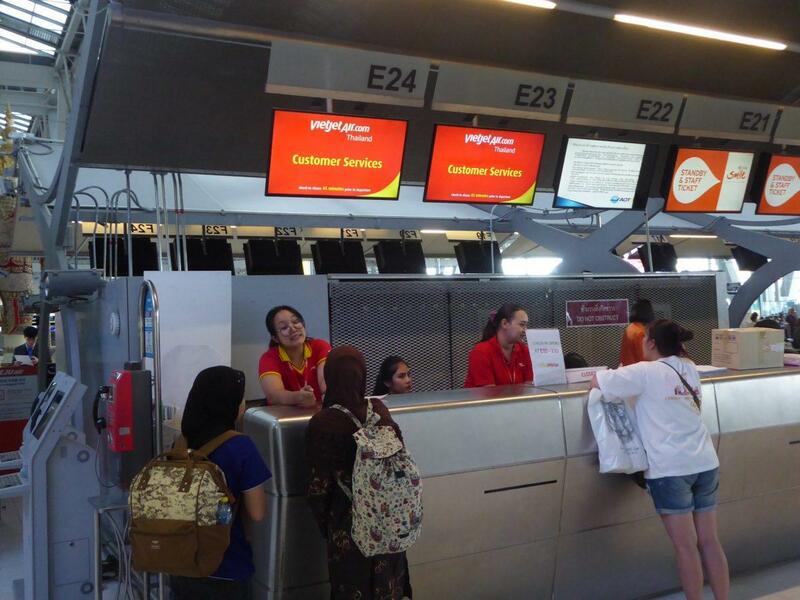 Jetstar and Cebu Pacific both fly exclusively from Suvarnabhumi Airport. You can search, compare prices, times and make reservations for both domestic and International flights using the form below. As well as Air travel in Thailand you can make bookings for internal & International flights in/between Malaysia, Cambodia, Laos, Vietnam, Singapore, Myanmar, Philippines, India, Japan, Sri Lanka, China, Hong Kong, Australia & New Zealand.